This makes it the ideal material for use in catering and domestic kitchens, laboratories, educational establishments, veterinary clinics and healthcare environments. You can use our frames to support items such as surfaces in Trespa, shelving or specialist laboratory equipment – or opt for an integrated stainless steel worktop, for a super-durable, unified design. Because we fabricate each of our frames in-house, you can specify the exact measurements you require, in any configuration, to fit even the most awkward of spaces. All joints are welded, and then ground and polished – making our frames easy to clean, and therefore suitable for clean-room and healthcare installations. From 304 food-grade steel for kitchens, healthcare environments and food technology classrooms to 316-grade, designed for laboratories, we have the resources to fabricate the structure you need. We can apply our unique workshop flexibility to the configuration of your frames – whether you require a movable unit with locking castors instead of the standard height-adjustable feet, or need to incorporate shelving, cupboards and work surfaces. We can build in lockable doors and drawers for offices, laboratories, veterinary surgeries, health practices and classrooms, or incorporate tray racks for eateries, or sinks for kitchens. The options are almost limitless: whether you require panels to the end and rear to provide enclosed spaces, or need a different size of box section from our standard 30 x 30mm, our skilled engineers can fabricate the frames your require to your exact specifications. Laboratories need a super-strong support structure, which will last for decades. That’s why we use only the finest-quality, most durable, 316-grade steel to fabricate our stainless-steel frames. This metal is not only extremely resistant to impact, but will also stand up to extremes of heat as well as acid spills. Ideal as a support system for our bespoke steel worktops, our metal frames can also be customised to support counter tops made from other materials, such as Trespa. Thanks to our unique factory set-up, we can tailor-make any design: whether you require a stainless-steel frame to support a tank or other specialist equipment; a skeleton for a large-scale laboratory plan; a support structure for bench tops; built-in cupboards and drawers; or integral sinks and hand-wash basins, we can fabricate metal frames to the exact size and specification you require. We can supply our frames with lockable castors instead of our standard height-adjustable feet, for an even more adaptable workspace. Crucially, all of our joins are welded, ground and polished, making them safe, easy to clean, and suitable for even the most sterile of laboratory environments. We can also incorporate a variety of sinks, including a recessed sink bowl in a special water-retaining area, to prevent spillage: check out our Sinks section for more information, or contact us today, to discuss your requirements. Our highly-skilled workforce has been supplying stainless-steel products to the education sector for decades. Whether you are outfitting a catering kitchen, a food technology room, a training laboratory or a playroom for a nursery, our stainless-steel frames will provide the perfect support structure. For laboratories, we use only the highest-quality, 316-grade steel for our metal frames. 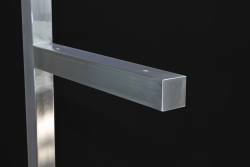 This steel is not only impact-resistant, but is also resistant to extremes of heat and to contact from chemicals. As all joins are welded, ground and polished, it is also suitable for clean-room applications. In all other environments, we recommend our 304, food-grade steel, which is equally durable and impact-resistant, and meets all current Health & Safety and Food Hygiene regulations. Thanks to our bespoke production base, all of our frames can be customised to your own designs. Whilst they can, of course, be used to support worktops in Trespa or other materials, they can also be built into a fully-integrated design, incorporating our stainless-steel worktops. These worktops are so durable, they will outlast all other materials – making them the cost-effective choice for your project. We can meet your requirements exactly, whether you need a steel bench top with a built-in sink or a recessed sink bowl to prevent spillage; a metal counter top with cupboards, shelves or drawers beneath it, or a whole wall of shelving. Where security is vital, we can fit locks to cupboards and drawers – and we can round off ends on worktops, so there are no hazardous corners. Take a look at some of the possibilities we offer, in the form of shelves, cupboards, worktops, fume cupboard liners, shower trays and sinks – or simply contact us today, to discuss your project. 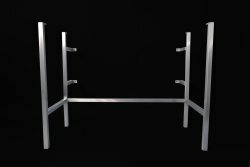 The sheer strength and durability of our 304, food-grade stainless-steel frames make them ideal support structures for your catering environment. Conforming to all current Health & Safety and Food Hygiene regulations, our steel frames can be customised, to fit any room shape and size, in any configuration. This entirely bespoke process allows us to meet your requirements precisely. 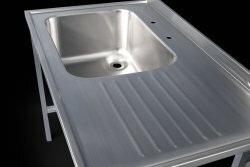 Whether you require the basic, open-style metal frame alone – or need stainless steel end-panels; integral worktops throughout; built-under cupboards and drawers; built-in sinks and hand-wash basins; or a set of shelves on lockable castors for transportable tray storage, we can fabricate the products you need. Unless you opt for the lockable castors, all of our frames are supplied with height-adjustable feet as standard, so you can be sure of achieving a super-strong, stable support structure for your catering kitchen. Take a look at our other products, from extractor canopies and preparation tables to shower trays, trolleys and wash troughs, to see how we can help you with your project – or contact us today, to discuss your requirements. Durable, hygienic and impact-resistant, our stainless-steel frames meet all the requirements for a modern washroom. They can be designed to support a counter top in any material, or combined with a stainless-steel worktop for a fully-integrated design. The modern, gleaming surface is naturally antibacterial and easy to clean, whilst the metal frames themselves will last for decades, making them extremely cost-effective. We offer a range of vanity tops, for a fully-integrated washroom scheme. These are welded, leaving no visible seams in which bacteria can hide and multiply. We can also fabricate bespoke, vandal-resistant plinths, for added protection in school and public washrooms. Our extensive range includes many more products – take a look at our sinks, hand-wash basins, shower trays, trough urinals, splashbacks, shelves and many other items, all of which can be incorporated into your plans. Contact us today, to discuss your project. 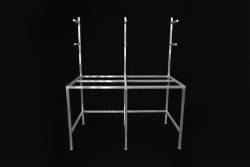 Our stainless-steel frames provide the perfect support structure for a bespoke kitchen or bathroom design. Supremely strong, heat-resistant and durable, they can support any type of worktop or provide a tailor-made framework for electronic equipment, such as fridges and washing machines. For the modern, streamlined home, integral stainless-steel worktops, shelving, cupboards and drawers can all be incorporated into the framework, creating a stylish, bespoke kitchen that is contemporary and chic, yet easy to clean and low-maintenance. Refer to our product pages for inspiration – we can create an almost limitless range of configurations for your storage units and worktops, plus preparation tables and trolleys – or contact us today, to find out how we can create the framework for your ideal living space. At DSM, we understand that every veterinary practice has its own, unique needs. That is why every one of our products is bespoke, so you can order the exact size and configuration of framework you need for your veterinary surgery. Whether your veterinary patients are large, heavy and feisty or docile and gentle, you need to start with a support structure that is super-resilient, strong, and will last for decades. Our 304, food-grade, stainless-steel frames are robust enough to hold any type of worktop, from Trespa to our own stainless-steel bench tops. 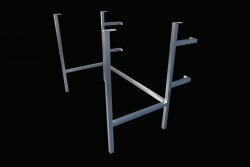 With height-adjustable feet as standard on all our steel frames, you can be sure of having a sturdy, level platform for your worktops, shelves and cupboards. 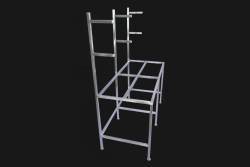 We also offer a range of fully-customisable storage units and shelving, which we can build into our metal frames. 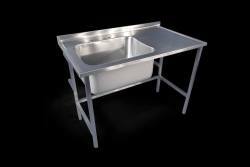 Add a stainless-steel worktop and a built-in sink or hand-wash basin; choose a stainless-steel plinth, to prevent patients from running beneath your bench top; add a mobile unit with lockable castors, in place of the standard height-adjustable feet... The options are almost limitless. 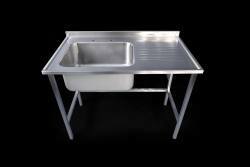 We also offer a wide range of other items, from stainless-steel examination tables to shower trays, wash troughs, hand-wash basins and sinks.